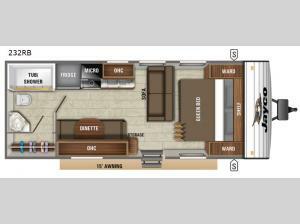 Just imagine sleeping and cooking inside a travel trailer while camping on your next trip. This Jay Flight SLX 8 232RB provides sleeping space for five, plus full kitchen and bath amenities. You will experience a semi-private front bedroom when you draw the privacy curtains and enjoy a good night's rest on the queen size Simmons mattress, plus there are wardrobes on either side and a shelf above. You can get cleaned up in the rear bath with a bathroom skylight for more natural lighting, plus there is an outside shower for those muddy excursions. You can also relax on the Jackknife sofa or play a game at the booth dinette while you visit with the cook. It's time to throw away the tent and make an upgrade for your family today!